A 76-year-old woman from a skilled nursing facility who was nonverbal at baseline secondary to an anoxic brain injury sustained twenty years previous presented to the emergency department after her care providers noticed bright red blood in her stool. Patient was reported to be taking a proton pump inhibitor for stress ulcer prophylaxis and low-dose aspirin daily. Her initial hemoglobin and hematocrit on arrival was 13.5g/dL and 38.8%, respectively, both within normal limits for her age. Abdominal and pelvic CT angiography was performed per institutional protocol for gastrointestinal bleed. The exam demonstrated a 5.4 × 3.7 × 4.4 cm (TRV by AP by CC) hematoma within the first portion of the duodenum. On the postcontrast images, the majority of the hematoma demonstrated peripheral thrombus formation with a central area of active contrast extravasation measuring approximately 2.3 cm, concerning for a pseudoaneurysm (Figure 1). Under local anesthesia (Lidocaine 2%) and using the Seldinger technique, a selective celiac axis catheterization (Cobra Glidecath, 5F, 65-cm-long) with a guidewire (Radifocus guidewire, 0.035”, 150-cm-long) confirmed the large right gastroepiploic artery pseudoaneurysm (Figure 2). Despite multiple efforts using a Simmons 2 catheter and a 3 French Progreat microcathether, attempts to reach the pseudoaneurysm via endovascular approach were unsuccessful due to vessel tortuosity. At this point, percutaneous thrombin with coil occlusion was suggested in light of the patient’s high-risk clinical condition. Under ultrasound guidance, a 22-gauge needle was advanced into the pseudoaneurysm and a A 4 French vascular sheath placed. Three-thousand units of thrombin was injected, resulting in instant thrombosis of the pseudoaneurysm. An 8 mm coil was also inserted for additional hemostasis; however, due to thromboses, the coil stayed within the margin of the pseudoaneurysm (Figure 3). 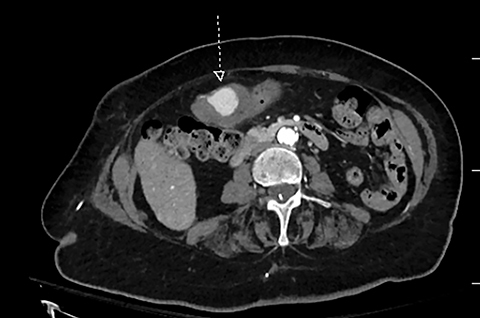 A follow-up common hepatic angiogram showed no significant opacification of the pseudoaneurysm. 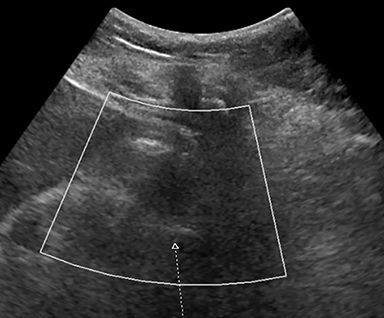 A follow-up ultrasound examination performed one month later showed a smaller and thrombosed pseudoaneurysm with no internal color flow (Figure 4). 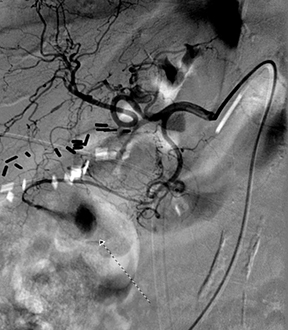 Generally, transcatheter-based approaches are used in cases such as these with embolization of the afferent and efferent arteries feeding the pseudoaneurysm.3 With the advent of microcatheters, this embolization can be achieved with coils, particles, or glue. In our case, due to the significant collateral circulation in the celiac arterial system (gastroepiploic, short gastric, and splenic arteries), the parent artery involved can also be sacrificed with low risk for local ischemia. Either endovascular or percutaneous approaches are used in these cases. The percutaneous approach is an alternative with localized injection of thrombin. This variant was first pioneered by Cope and Zeit for the treatment of iatrogenic femoral artery pseudoaneurysm and subsequently used in limited case studies for other instances of successful repair.6 To our knowledge this successful visceral artery pseudoaneurysm repair with percutaneous thrombin injection is the first for ruptured right gastroepiploic artery pseudoaneurysm. Visceral pseudoaneurysms are rare entities that can result in catastrophic events if not recognized early and treated appropriately. While the initial management remains debatable, interventional embolization has continued to be at the forefront of treatment management. It is important to recognize that in cases of failed endovascular approach due to vessel tortuosity, percutaneous embolization under ultrasound guidance can achieve successful results. Pasha SF, Gloviczki P, Stanson AW, Kamath PS. Splanchnic Artery Aneurysms. Mayo Clin Proc. 2007;82(4):472-479. Bergert H, Hinterseher I, Kersting S, Leonhardt J, Bloomenthal A, Saeger HD. Management and outcome of haemorrhage due to arterial pseudoaneurysms in pancreatitis. Surg. 2005;137:323–328. Carr SC, Pearce WH, Vogelzang RL, et al. Current management of visceral artery aneurysms. Surg. 1996; 120:627. Ferrero E, Viazzo A, Ferri M, et al. Management and urgent repair of ruptured visceral artery aneurysms. Ann Vasc Surg. 2011; 25: 981.e7-11. Coll DP, Ierardi R, Kerstein MD, Yost S, Wilson A, Matsumoto T. Aneurysms of the pancreaticoduodenal arteries: a change in management. Ann Vasc Surg. 1998; 12 (03) 286-291. 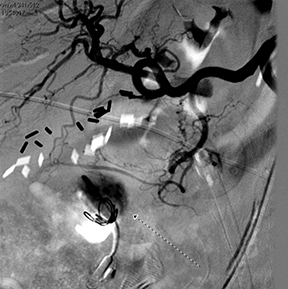 Chadha M, Ahuja C. Visceral Artery Aneurysm: Diagnosis and Percutaneous Management. Semin Intervent Radiology. 2009; 26(3): 196-206. Zhang A, Singh C, Patel D, Svrcek P. Percutaneous thrombin and coil occlusion of right gastroepiploic artery pseudoaneurysm. Appl Radiol. 2018;47(10):30-31. Prepared by Dr. Zhang while a second-year radiology resident; Dr. Singh while an Assistant/Clinical Professor of Radiology; and Dr. Svrcek while a medical student, all at the University of Connecticut School of Medicine, Farmington, CT, and Dr. Patel while a medical student at Quinnipiac University School of Medicine, Hamden, CT.